For decades now, we at Arcflex have been supplying high quality gas meter flex as part of our extensive range of components and fabrications. Gas meter flex hoses are a vital part of many industrial fabrications, and it is vital that they are quick and easy to fit, safe to operate, and are long lasting and durable. To ensure this is the case, our gas meter hoses are designed to allow for any small misalignment in the system. When you choose the experts at Arcflex to provide your business with gas meter flex, you are making an excellent choice in terms of quality, cost effectiveness, and durability. 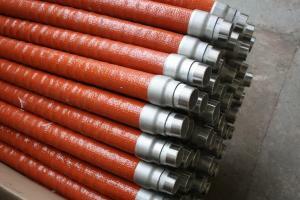 Generally, gas meter flexible hose for commercial and domestic application are soldered together. Our construction differs from this as we have found much more reliable and effective results when welding them instead. This has the added benefit of making them more resistant to the effects of fire. As well as supplying new components and fabrications, we also offer expert repairs and servicing, as well as technical visits. Furthermore, we often provide emergency repairs and replacements to keep your business operating as effectively as possible. You can find case studies for some of our previous projects here. If you are in need of gas meter flex, please don’t hesitate to call us. We’re always happy to discuss your requirements, and offer any help and advice you may need.